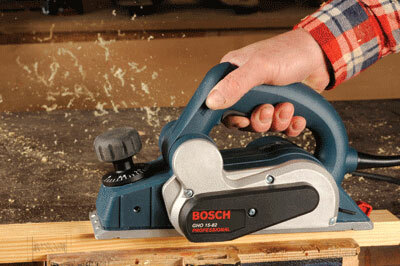 Bosch seem to have a humongous range of tools now - I do not think we will ever have time to look at them all - but this rather neat planer from their Professional range seems an obvious one to try, as there are times when a quick trimming of a door, or flatting a length of sawn 75 x 50mm is just done much more easily with power than by hand. The casing of this planer is extremely tough polyamide guaranteed to take a lot of hard knocks. There is no rubber overmould present this time, and a slightly uncomfortable feel where the casing line meets on top of the handgrip. A safety lock protects against accidental switch on of the heavily sprung trigger. The rubber coated front grip knob allows very easy click-stopped depth changes with a very clear scale in 0.1mm steps. The soleplate is finely machined aluminium, the front section having no less than three different sizes of V groove for bevelling arrises. The cutterblock is apparently made from bright chromed steel segments bonded together to create a heavy well-balanced block which takes two standard disposable blades. At the back end of the soleplate is a sprung tab to prevent the spinning cutters digging in when the planer is put down after use. A tough adjustable chromed steel fence and a large zipped dustbag complete the kit along with spare blades. Considering this is a ‘trimming’ planer with a 600W motor and a maximum depth of cut at 1.5mm, this machine is quite heavy and has plenty of power. The soleplate isn’t 100% flat but it produces a very acceptable result. Zero on the depth scale is not quite so - it still removes a minimal amount of material. 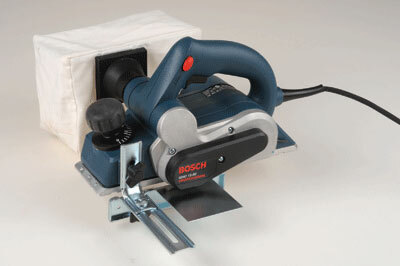 Quality and pricewise this is a good machine and definitely one to keep in the site kit.